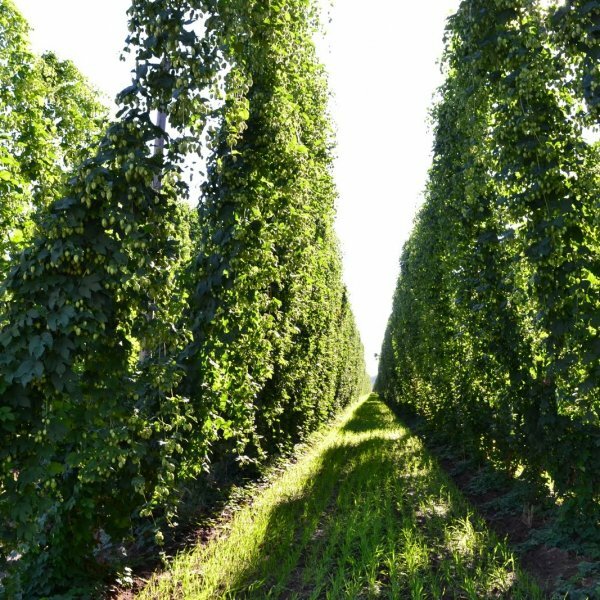 Attractively cloaked in deeply lobed leaves, hops produces pine-scented flowers that are widely used to preserve and flavor beer. 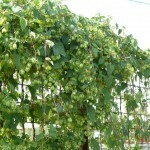 A fast growing, perennial vine, it is native to North America, Europe and western Asia. The tender new stem tips can also be harvested and cooked as a vegetable. The bright to medium green leaves are lobed, usually three or five in number and have teethed edges. In summertime, plants flower. 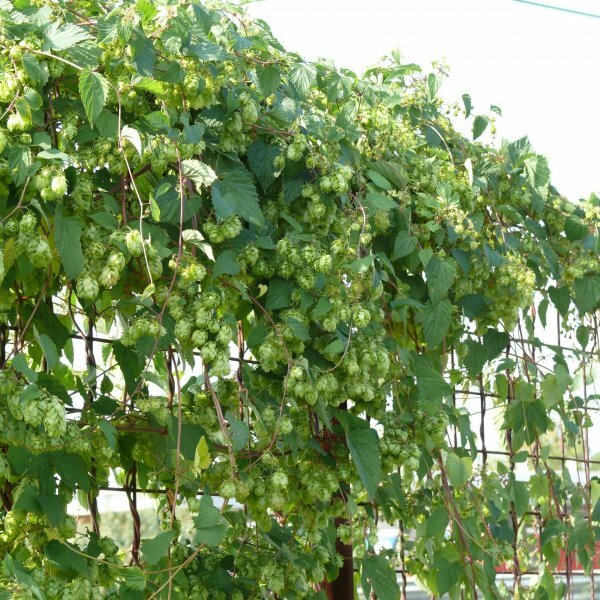 Being dioecious, the hops vine is either male or female in gender. 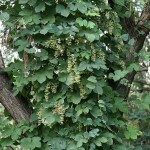 The male vines have tiny flowers that appear among the leaves, whereas the female plants bear larger, showier spikes that look like cones and smell of pine. They are first green in color and become magenta-pink. 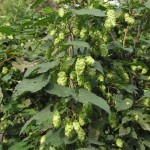 They dry to a light beige, and only these female blossoms are utilized in the beer-flavoring process. 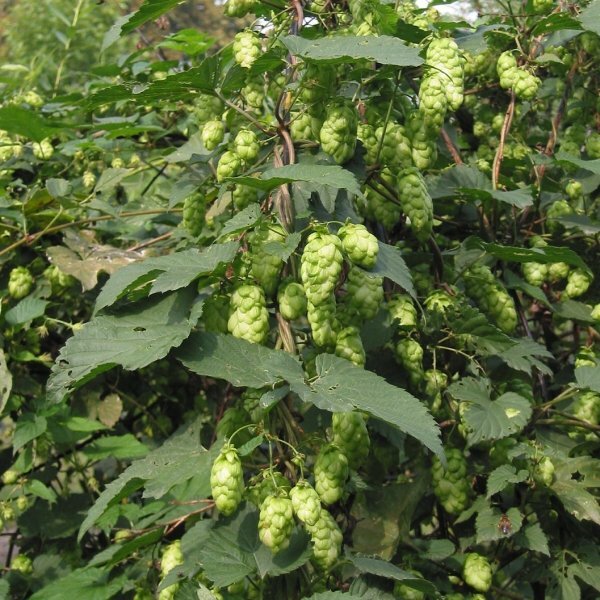 Plant hops in full sun to partial shade in a moist, fertile and humus soil that never becomes soggy. 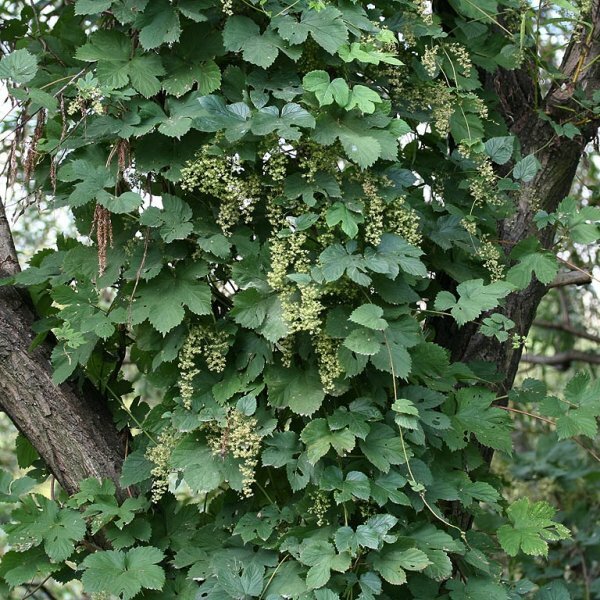 Quickly growing, it can be trained upon a trellis or allowed to ramble over or up into a nearby woody shrub or small tree. Typically only female plants are sold at nurseries. In hot, humid climates grow with some afternoon shade and monitor for mildew and wilt diseases. Germination Hop seeds require cold temperatures to break dormancy. Use a process called "cold scarification" to encourage hop seed germination. 1. Put seeds in an equal amount of moist sand and refrigerate from one to three months at about 41F (~+4C). 2. After the pretreatment, sow on the surface of sterile soil. Cover with clear plastic, keep in warm and bright room. Seeds germinates in 1-2 months. If the seeds have not germinated, put them back in the refrigerator and repeat the cycle. 3. When leaves appear, they need at least six hours of bright light each day. Do not plant them outdoors until after the last frost.